Need to look presentable in 5 minutes or less? Then the Military Shave is just the technique you’re looking for. In the military soldiers are expected to be presentable at all times, even in the field. As you can probably imagine this leaves little time for a comfortable, relaxing shave. However, it does leave time for a quick, efficient shave. This was Joseph Abbatangelo’s inspiration for creating and naming this shaving technique. He also took a que from the famous quote “Perfection has been achieved not when there is nothing left to add, but when there is nothing left to take away.” stated by Antoine Saint-Exupery. 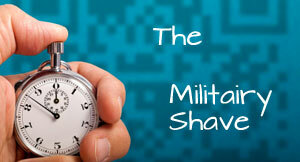 In any event, the Military Shave is fast and gets the job done. The Military Shave is very straight forward as you’d imagine. Perhaps the only caveat is the fact that it calls for a brand of shaving gel known as RazorRock Shave Gel. This gel was developed by Joseph Abbatangelo’s company especially for this shaving technique. Aside from that all you need is a sharp razor and some water, preferably running water though a bucket will do just as well. Optional is an Alum block or stick to use after the shave is completed. Let’s go over the steps in order. Step 1: Wet your face and apply your shaving gel. This is a cleaning process so be through then rinse to remove any dirt and build up. Step 2: Take more shaving gel and massage it onto your face, going against the grain. Step 3: Take your razor and begin to shave following the flow of the grain of your beard. Once this is complete rinse your face off. If you want a slightly closer shave reapply the gel and shave against the grain with light strokes. Step 4: Rinse your face with cold water and use the Alum block or stick if you want. There, you’re done! As you can tell this style of shaving is very fast and easy to perform and is great when you find yourself in a pinch and need to shave quickly. 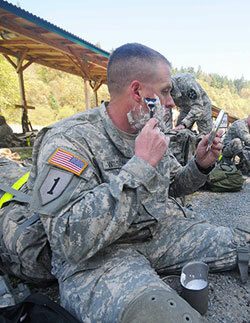 Even if you don’t particularly need to rush your shaving habits the Military Shave can still be a great option if you simply don’t want to spend an excessive amount of time shaving your face every morning. If there are other areas of your body that need to be shaved the Military Shave can be a handy option in those cases as well. Just be careful when shaving delicate areas. What’s the Best Safety Razor? Facial Hair Removal for Men with Sensitive Skin, Do Creams work?